We have been partnering with rural-based municipalities throughout western Canada for over 35 years. We focus on delivering practical, cost-effective solutions to meet the immediate and ever-emerging needs of their communities’ water and wastewater management systems. These principles drive our efforts to constantly improve service and ensure our clients and their communities are always receiving value from their investment and our relationship. 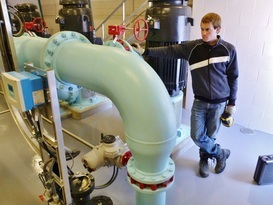 Serving as General and Maintenance Contractor leading the major capital expansions of Water Treatment Plants for a multiple of urban and rural communities, such as Foam Lake, Emerald Park and Hodgeville. Serving as the Maintenance Contractor leading the major capital upgrade to various municipal sewage lift stations, including the community of Kronau. Serving as General and Maintenance Contractor leading the design and installation of major capital improvements to the distribution pump and water piping systems for several communities including Star City, Herbert and Beausejour. Serving as the Maintenance Contractor leading the major upgrades to water filter systems, main valve replacements and main line swabbing for various communities including Meath Park, Vibank, Elrose and Ponteix. Served as Maintenance Contractor leading the annual servicing and repair to community water hydrant systems for communities including Chaplin and business's such as the Moose Jaw Oil Refinery. Providing over 100 western communities with Emergency Water and Sewer Repair support and diagnostic consulting that improves overall system performance and reliability.